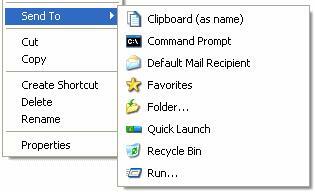 Typically, right click on the folder will bring users to some options that can enable them faster access to certain functions. While existing Windows capability is still very limited especially in ‘Send To’ menu, Send To Toys v2.5 adds extra functionality into the menu shell, intending to make it a much more effective way to speed up daily operation in front of PC system. While not all of them are frequently accessed, Send To Toys allows users to selectively add in what are needed from a configurable quick lists, on top of what is already available in existing right click menu button. Some of the great enhanced functions include the addition of favorite folders into ‘Send To’ menu option. To do so, just go to the respective folder, right click on it followed by ‘Add to Send Folder’. Besides, it enables fast copy of file name into clipboard or even output it to the command prompt for execution. On top of this, there are more useful functions such as “Send to Folder”, “Send to Favorite”, “Send to Quick Launch” and much more that may suit to different users’ preference. The software utility is compatible with Windows OS such as 2000, XP and Vista. It is only consumes less than 1MB space and is free downloadable at Send To Toys 2.5.